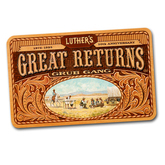 Luthers Bar-B-Q is a leading privately owned company based in America and it is categorized under barbecue and it operates in the restaurant industry line of business. Luthers Bar-B-Q owns and operates a chain of restaurants which are located in Colorado, Texas and Louisiana. Luthers Bar-B-Q also owns and operates small restaurants which they designed for the take- out purposes only. Luthers Bar-B-Q is a full service restaurant business that offers eating and drinking place services. The company was founded in the year 1975 and it has grown from a single restaurant into one of the leading chain restaurants in Mexico. The company is based in Houston, Texas. There are currently 0 consumer reviews about Luthers Bar-B-Q available. Share your review. Please take a note that you are about to post a public review about Luthers Bar-B-Q corporate office on CorporateOffice.com. This review will be public, so please do not post any of your personal information on this website. If you would like to contact the corporate offices of Luthers Bar-B-Q, please use their contact information such as their phone number, website, and address listed above to contact them. However, sometimes staff from Luthers Bar-B-Q headquarters do read the reviews on this website.